As we head into the final days of 2015, the general aviation community has once again been served with a fresh reminder of the very real threat to the industry from a proposal from the airline lobby that would create a privatized Air Traffic Control (ATC) system, funded through user fees, as part of legislation for the upcoming reauthorization of the Federal Aviation Administration (FAA). Let me explain the situation, and the actions NBAA needs you to take in response. Earlier this week, in Washington, DC, multiple CEOs from many of the nation's largest airlines gathered with their association president for a press teleconference to call for privatizing ATC and funding it with user fees. If anyone doubted the CEOs' intention, a resulting USA Today headline made it clear: "Airline executives urge privatization of air-traffic control." The reason for the timing of the airlines' push for this proposal is simple: Congress has just concluded its work on a separate measure for highway funding, and it is likely that FAA reauthorization will be the next major transportation measure taken up by lawmakers. With an eye toward this scenario, the airlines are readying for the coming battle over ATC privatization funded by user fees, and we must do likewise. The business aviation community must once again also band together in active opposition to such a proposal. You can do that now, by using NBAA's Contact Congress resource. Our continued mobilization on this issue is critical - in calling for ATC privatization, the big airlines want nothing less than a system they define and control for their own benefit. Under such a setup, Congress would be stripped of its long-standing authority over aviation-system governance, which safeguards the public's interest, including the companies and small communities that rely on general aviation. That role would instead be relegated to a self-serving "board" or similar entity, equipped with sweeping authority to make decisions in the airlines' business interests - for example, determinations about where and when companies using business aviation can fly, how much it will cost to do so, which community airports will (or won't) be given priority, and what type of payment, including user fees, will be demanded of operators. As NBAA members know, I have been raising concerns about this matter for some time, in testimony before Congressional lawmakers, and in policy forums hosted by such diverse interests as the U.S. Chamber of Commerce and the Air Traffic Controllers Association. NBAA members, local business aviation groups and others have likewise been weighing in, alerting Congress to this concern. As the year draws to a close, we in business aviation have an important opportunity to alert Congress once again. Lawmakers will soon return to their states and Congressional districts for the holidays - by using Contact Congress now, we can let them know that when they are at home, they will hear from constituents about this issue. By meeting with elected officials in the coming days and weeks, we can also make our voices heard. By discussing the issue at seasonal community events, we can prompt others to take action. In short, by remaining mobilized on this issue, we can help shape our destiny on a matter of critical importance to business aviation. 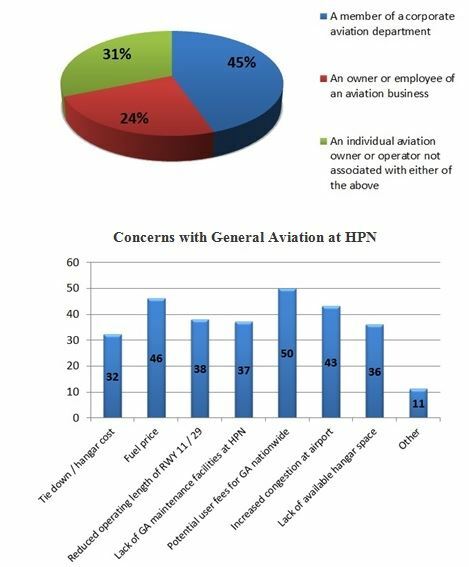 Recently we conducted a survey to get your feedback about the state of general aviation at HPN. Our Board of Directors want to effectively address the issues you perceive and thank you for your participation! 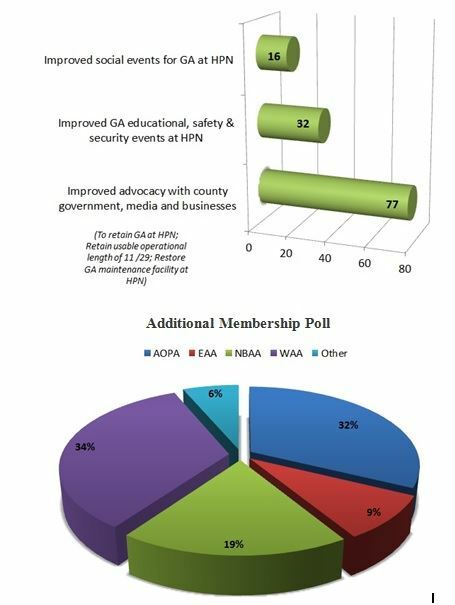 Below are the results of our efforts and the collective opinions of 112 participants. Have you noticed something missing from the entrance of our airport? Not too worry as our honorable "Gate Guardian" is undergoing restoration and will be back next month to once again stand tall. The aircraft was originally mounted to the pole on Saturday, December 21,1996 @ approximately 1:00PM. Former County Executive Andy O'Rourke developed the inspiration for the project, DPW managed and coordinated the project, and Lothrop Associates were the designers on the project. The aircraft is on loan to the County from the National Naval Aviation Museum, and while in airport custody, it must be maintained and displayed in a proper manner for compliance with the loan agreement. Airport manager Pete Scherrer commented, "For almost twenty years, the aircraft has stood vigilantly at her assigned post, greeting all those whose use our Airport. It has now come time for 'Our Girl' to get a 'make over'." The proposed schedule is to remove the aircraft from her post during the month of September, and transport her to a repair shop in Tarrytown. During the month of October the aircraft will be fully inspected for the presence of metal corrosion and/or stress fractures. Repair will be completed as required, the old paint will be stripped from the aircraft surfaces, followed by the application of new paint and aircraft markings. The airport anticipates that the aircraft will be returned to her assigned post during the Month of November. In light of the recent FAA privatization bill, WAA wrote to Congress opposing this bill for various reasons. Recently, we received a response letter from Congressman Eliot L. Engel, the U.S. Representative for New York's 16th congressional district. In the letter below, he expresses "concerns about privatizing the safest air traffic control system in the world" and states "I do not believe privatizing the system is a move in the right direction." The WAA will keep updating our membership and the community both here and in our newsletters as this issue continues. Note that last month an extension to the bill was granted by the House and FAA funding will continue through March 31, 2016. Thank you for contacting me in opposition to the privatization of the US air traffic control system. I appreciate knowing your views on this issue. As you know, in June, Chairman Bill Shuster of the House Committee on Transportation and Infrastructure announced his intention to call for the privatization of the country’s air traffic control system. Such privatization would entail the creation of a new non-governmental corporation to manage air traffic control in the United States. Presently, air traffic control in the U.S. is handled by the Federal Aviation Administration (FAA). I have significant concerns about privatizing the safest air traffic control system in the world. The current system handles over 2 million passengers safely and efficiently daily, and I do not believe privatizing the system is a move in the right direction. While Chairman Shuster has yet to introduce legislation concerning this issue, funding for the FAA is set to expire on September 30th. Please be assured that I will keep your concerns in mind should provisions regarding the privatization of the country’s air traffic control system be included in any proposed FAA finding measure. Again, thank you for taking the time to share your views. Please do not hesitate to contact me or Catherine Barnao, my legislative assistant for transportation issues, whenever you have a matter of interest or concern. Catherine can be reached at Catherine.Barnao@mail.house.gov or 202-225-2464. BBA Aviation plc announced today that it has agreed terms for the proposed $2.065 billion acquisition of Landmark Aviation (Landmark) from affiliates of The Carlyle Group. Landmark operates a global network of Fixed Base Operations (FBOs), Aircraft Maintenance and Aircraft Management and Charter businesses. This acquisition represents a major expansion of Signature Flight Support (Signature), a BBA Aviation company, and the world’s largest FBO network. The transaction is subject to regulatory and shareholder approvals and is expected to close in early 2016. Landmark has 68 FBOs that are complementary to Signature’s existing network of 133 wholly owned and affiliate global locations. Landmark’s aircraft maintenance locations will also supplement Signature’s existing MRO operations delivered through its Signature TECHNICAir and CSE Citation Centre brands. Landmark’s aircraft management and charter fleet numbers over 110 aircraft. Commenting on today’s announcement, Simon Pryce, Chief Executive of BBA Aviation said, “This is a transformational step in the continued execution of BBA Aviation’s strategy that is both strategically and financially compelling. It represents a unique opportunity to materially expand our global Signature FBO business and deepen our exposure to the attractive B&GA market with its structural growth drivers. The acquisition would enable customers to benefit from an extension of Signature’s industry-leading service offering and its operational excellence across a much larger network of high quality locations. Combining Signature and Landmark Aviation also would realise significant cost synergies as well substantial tax benefits. J.P. Morgan Limited acted as sole financial adviser to BBA Aviation in connection with the transaction. Slaughter and May are serving as legal adviser as to English Law to BBA Aviation on the transaction. Sullivan & Cromwell LLP are serving as legal adviser as to U.S. Law to BBA Aviation on the transaction. Barclays Bank PLC, acting through its investment bank, acted as an adviser to BBA Aviation on certain financial aspects of the transaction. Morgan Stanley & Co. LLC and Evercore Group L.L.C. acted as financial advisors to Landmark in connection with the transaction. Latham & Watkins LLP, Jones Day and Zuckert, Scoutt & Rasenberger LLP are serving as legal advisors to Landmark and Carlyle on the transaction. Signature Flight Support, a BBA Aviation plc company, is the world’s largest fixed-base operation (FBO) and distribution network for business aviation services. Signature services include fueling, hangar and office rentals, ground handling, maintenance and a wide range of crew and passenger amenities at strategic domestic and international locations. Headquartered in Orlando, Florida, Signature currently operates at more than 130 locations in the United States, Canada, Caribbean, Europe, South America, Africa and Asia. Headquartered in Houston, Texas, Landmark Aviation operates a network of fixed base operations located throughout the U.S., Canada and Western Europe. The Company offers a wide range of services, including FBO, MRO, aircraft management & charter. Landmark is a portfolio company of The Carlyle Group. The Carlyle Group (NASDAQ: CG) is a global alternative asset manager with $193 billion of assets under management across 128 funds and 159 fund of funds vehicles as of June 30, 2015. Carlyle’s purpose is to invest wisely and create value on behalf of its investors, many of whom are public pensions. Carlyle invests across four segments – Corporate Private Equity, Real Assets, Global Market Strategies and Investment Solutions – in Africa, Asia, Australia, Europe, the Middle East, North America and South America. Carlyle has expertise in various industries, including: aerospace, defense & government services, consumer & retail, energy, financial services, healthcare, industrial, real estate, technology & business services, telecommunications & media and transportation. The Carlyle Group employs more than 1,700 people in 35 offices across six continents.